Patna Metro Rail Project will be executed in five years with an estimated cost of Rs. 13,365.77 crore. 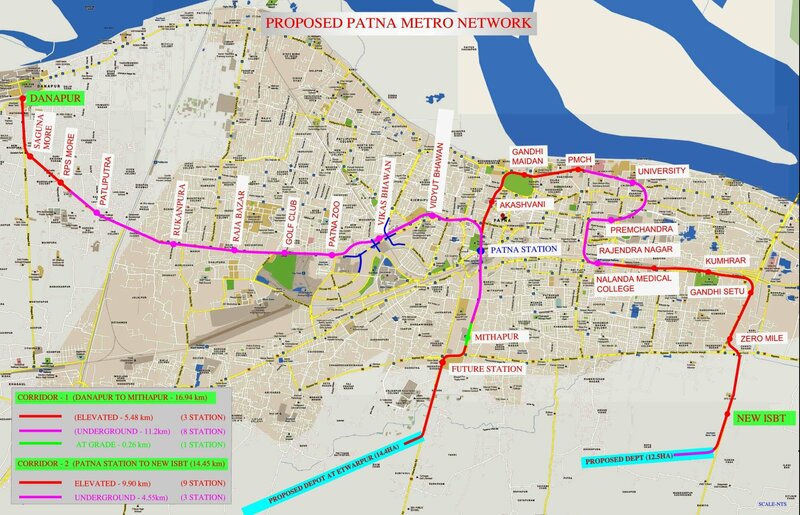 The central government has also released the Patna metro proposed route map and other details. Patna, Metro Rail News: In a major boost to public transport in Patna, Narendra Modi government has Approves Patna Metro Rail Project comprising of two corridors on February 13, 2019. Patna Metro will be Bihar’s first metro and the mass rapid transit will surely become the major mode of communication in Patna. A Cabinet meeting chaired by PM Shri Narendra Modi has taken the decision. The cost of the project is estimated at Rs 13411.24 crore. The project is scheduled to be completed in 5 years. Patna Railway Station to New ISBT corridor will pass through 14.45 km stretch. The Danapur Cantt-Mithapur corridor will cover the areas located in the heart of Patna. The people residing in densely populated areas will have access to Patna Metro. Patna Metro stations will come up at Raza Bazar, the Secretariat, the High Court and the Law University Railway Station. The second corridor from the Patna Railway Station to ISBT corridor will pass through key locations such as iconic Gandhi Maidan, PMCH, Patna University, Rajendra Nagar, Mahatma Gandhi Setu, Transport Nagar and ISBT. Providing details regarding the Patna Metro rail project, the central government said the Danapur-Mithapur corridor will be mostly underground and partly elevated. The Danapur-Mithapur section of Patna Metro will have 11 stations. Out of these 11 stations, three will be elevated and 8 would be underground. The 14.45 km-stretch of Patna station to New ISBT corridor will see an elevated stretch of 9.9 km and partly underground 4.55 km. This section Patna Metro will have 12 stations. Out of these 12 stations, 9 will be elevated and 3 will be underground. Patna Metro will provide an alternative mode of communication to a population of 26.23 lakh. They are likely to be benefitted by the Patna Metro Rail Project directly and indirectly. The central government said that people residing in these areas will be able to travel on metro trains from one spot to different areas of the city conveniently. Patna Metro will also focus on the last-mile connectivity as there will be multi-modal integration with railway stations and ISBT. Patna Metro will also run feeder network of bus, Non-Motorised Transport (NMT) and Intermediate Public Transport (IPT). The central government has stated that the Patna Metro rail project will have non-fare box revenue from rental and advertisement. Apart from these, there will be Value Capture Financing (VCF) through mechanism of Transit Oriented Development (TOD) and Transfer of Development Rights (TDK).